With recent releases on Tar Hallow, Planet Rhythm and his own label Mechanism Industries, experienced US artist Fanon Flowers is not willing to send any signals about retirement. Born in Michigan’s Kalamazoo, a musically important location between Detroit and Chicago, current L.A. resident Flowers may feel predestined to spread the message of techno and he keeps expanding his glorious back catalogue. When going back to the beginnings, in 1995 Flowers appeared under different acid techno aliases on Analogue Reference Audio, Drop Bass Network and Phoq U Phonogrammen, before resuming his creative fertility with the launch of Mechanism Industries in 1996. 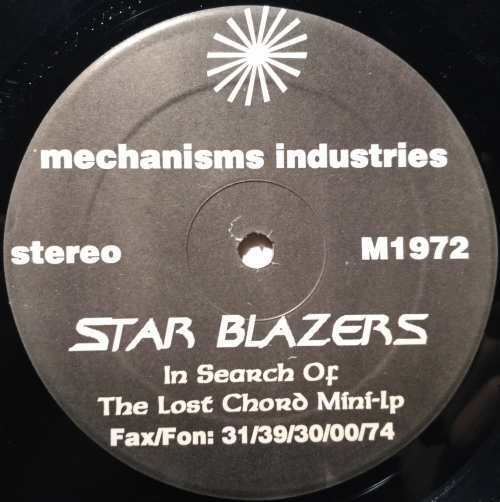 His only release as Star Blazers is a versatile techno mini LP where Flowers leads the charge with the support from a few contemporaries. Moving bravely at 140 BPM and more, “In Search Of The Lost Chord” contains a number of mid-nineties U.S. techno influences, starting with fast-paced harshness in Hardwax or Black Nation style in “Departure”, while “Lost Chord” offers an ampler interpretation of Terrence Dixon’s minimalist loops amid acid gusts that have a central role throughout the release. A sudden change of mood happens in “Sweet Rain”, where guest producers Kraig Allen and John Boys have succeeded to marry abyssal bass with nocturnal chords, in a tune that could belong to the 430 West family. The B-side is dominated by acid-minded variations of the theme “Wave Motion”: in the first part raw electro breaks keep up the thrill, followed by a distorted techno storm in Drop Bass style for spectacular annihilation. The fast-paced “Transitional Man” would match Rob Hood’s early tracks, when the guest appearance is made by Myles Sergé, a producer rather associated with the ongoing decade. Two locked grooves round up the package that deserves to be rediscovered in our times.